We always love welcoming enthusiastic & vibrant groups of young teachers and lecturers for our special Teacher Training Workshops at IALF Bali. 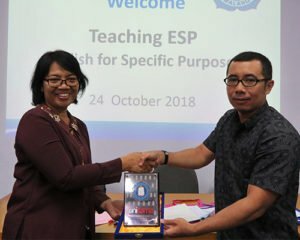 Take our latest collaboration with Universitas Kanjuruhan Malang, were a total of 52 students and lecturers took part in a 2-hour Teacher Training Workshop on the topic of Teaching English for Specific Purposes (ESP). The wonderful workshop was facilitated by our very own Ibu Komang Wartini, the Assistant Manager for the IALF Teacher Training program. 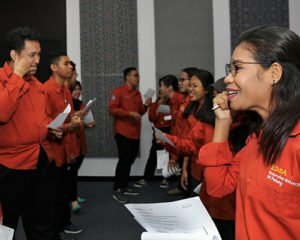 During this workshop, students learned how to meet the demands of students to carry out relevant and effective English classes according to each student need, whether it be English for business, international English test preparation or for specific industries. As you can see in the photos, they had a great time. Thank you to all the students and lecturers. We hope that you will soon be using what you learned. Hope to see you all again soon! If you also like us to run a special workshop for your students (and lecturers) as part of your study tour program, contact Ibu Wayan Sumiasih (Sumi) at wsumiasih@ialf.edu for details of topics and schedules. 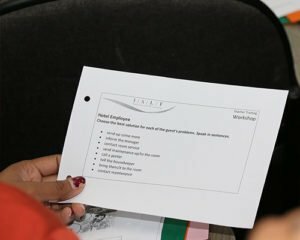 We have a range of courses for elementary school teachers, high school teachers and university lecturers. We also offer training on Teaching IELTS and Teaching TOEFL®.